Buffets give you a host of food options, but they’re not exactly havens for healthy choices. Many buffet items are packed with calories, sodium, saturated fat or added sugar, and all of those substances continue to add up when plates are piled high or heaped with second and third portions. 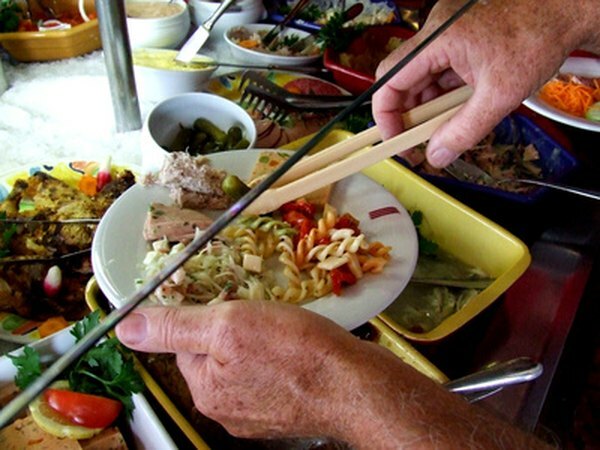 Although it can be a challenge, you can still make healthy choices when eating at a buffet. Divide your plate into segments before you begin choosing foods from the buffet. The Harvard School of Public Health suggests filling your plate half- to three quarters-full with vegetables first. Then add lean meats, grains, starches and other foods in the remaining space. Piling your plate with vegetables can help fill you up before hitting the calorie- and fat-heavy items. Choose foods that are as nutritious and low-calorie as possible. Usually, the most nutritious foods are whole, unprocessed and fresh or more simply prepared. Stick with options such as nonfat dairy products, fresh fruits and vegetables, whole grains and lean meats or plant-based proteins. Processed foods often don’t have as many nutrients as whole foods. Eat foods that are grilled, steamed, baked or broiled. These dishes typically have less added fats and salt than dishes that are stir-fried, pan-fried or deep-fried. Casseroles and pasta dishes may also contain added fats and excess salt. Pay attention to portion size. Since most buffets are self-serve, you have the opportunity to take exactly what you want and leave the rest behind. MayoClinic.com suggests attempting to focus on a few foods at the buffet that you know you will enjoy and are healthy choices. Avoid the temptation to try lots of foods. Minimize marinades, toppings, sauces and condiments that will add extra, hidden fat, calories or sugar. Choose vinaigrettes instead of oil- or cream-based salad dressings. Avoid salads and other foods that already have added dressing. Avoid heaping your plate with food. Eat slowly, deliberately and thoughtfully, paying attention to physical cues from your body. Chew your food well and stop eating just short of the point when you become full. Stopping at a comfortable point lowers the risks of bloating, indigestion and heartburn. Harvard School of Public Health: Vegetables and Fruits - What Should You Eat?